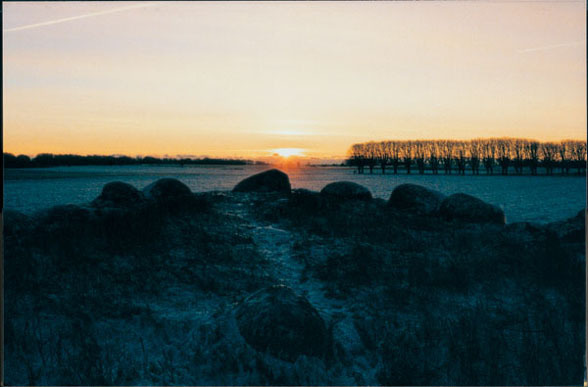 The shiplike formation of stones at Stenhed, like that at Ales stenar, has been arranged to account for the 365 days of the solar year and the 24 hours of day and night. The just over 50 meters long and 14 meters wide stone configuration consists of 30 boulders midships. You can see another three stones placed in the axisline, the center stone being the sun observation point. Keeping track of the solstices, equinoxes, months and determine the time for sowing, harvesting, offering, festivals and slaughtering rites was important to the religious cult of the ancient nordic people. 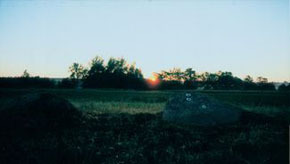 From this observation stone, the sunrises and sunsets can be read off at stones 15 - 1 - 4 - 6 - 7 and 8. The year is divided into eleven months of thirty days each and one month of 35 days. The passing of the sun between the opposing stones is the same as at Ales stenar, that is exactly 6 months and 12 hours. 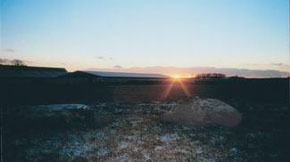 An example: at the vernal equinox the sun rises at 0600 hours over stone no. 6 in the east. At the autumnal equinox the sun sets at 1800 hours over the opposing no. 6 stone in the west. 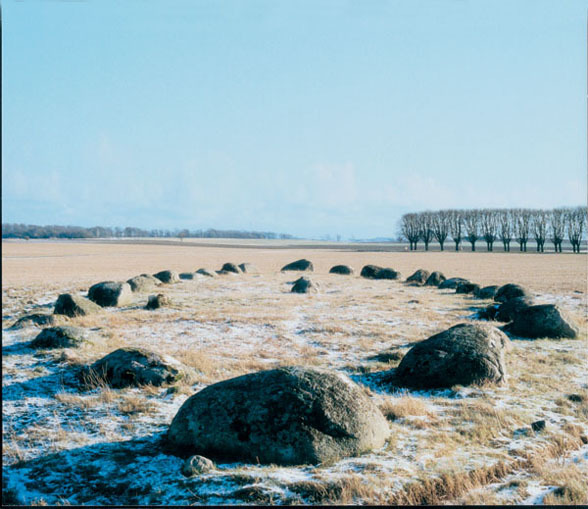 Unlike at Ales stenar, the stem stones at Stenhed mark the middle of winter and summer - facts which were very important for the people of that time. In many of the stones you will find indentations typical of the Bronze age, suggesting that Stenhed might have been built during the latter part of it. Already 5.000 years ago the Egyptians had an exact calendar for the 365 days of the solar year and divided the day and the night into 24 hours. Stenhed can be used as a sundial in the same way as Ales stenar. Place the staff at the observation place at the angle of 70° 1 towards the north. The shadow of the sun will fall on one the 16 stones - the so-called sun watchers 2 . The distance between each stone is called one sun watch of 1,5 hours. This symbolizes the 24 hours (16 stones x 1,5 hours) of day and night..
A narrow asphalt road runs westwards from E. Herrestad church to Stenhed..